The city authorities at Kariya run a small park which aims to teach the rules of the road to very young children. The main attraction is a miniature sized road network which includes traffic lights, bollards, and street signs. There are also a few rides; a pirate ship, a cycle railway, a miniature tower ride, and a small roller coaster. 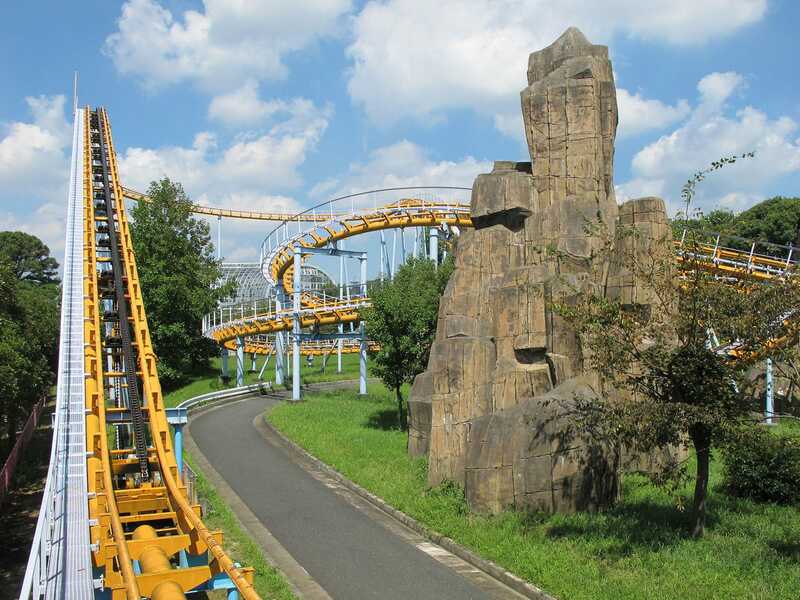 Despite its name, Kids Coaster (#1689) is a substantial ride, more suited to family groups rather than children only. Better yet, the cost per ticket is a tiny ¥50 in a country where most attractions cost at least six times that. We managed to buy more tickets than required, due to not reading the pricing information properly, but that worked out just fine as we were happy to ride more than once. The second stop of the day was a nature park located within sight of Futagawa train station. The main draw here seemed to be an observation tower which provided a spectacular view of the local area. Unusually this was built out of concrete, and no attempt was made to disguise the dirty grey structure, making it truly hideous to behold. The imaginatively named Coaster (#1690) turned out to be an unexpected gem, similar in many ways to Rocky Coaster but much smoother to ride. Though there were other guests in the park, the only time we saw this move was when we were on it, suggesting that it may be a bit much for the locals. We also tried out a small target shooting dark ride and the ferris wheel. Our final stop was at Lagunasia, a park that really impressed me on my previous visit six years ago. The only major change in that time has been the removal of the brilliant Treasure Hunting in favour of a new roller coaster. Pirates Blast (#1691) is a thrilling journey through the theming from the old ride, taken at a pace and speed that is very reminiscent of Indiana Jones and the Temple of Doom. The result should have been brilliant, but was hurt badly by the quality of the ride hardware. There were several seriously rough moments on the ride, the worst of which came as the train broke out into daylight at the end of the course. I still managed six laps, but had to give up at that point due to being repeatedly hit in the same places. Beyond that, we repeated the other coasters. I'd forgotten that Stellar Coaster is a pretty good ride, though it is still eclipsed by the superb Aqua Wind. There was also ample time for a repeat of Magical Powder and Fire Fire.